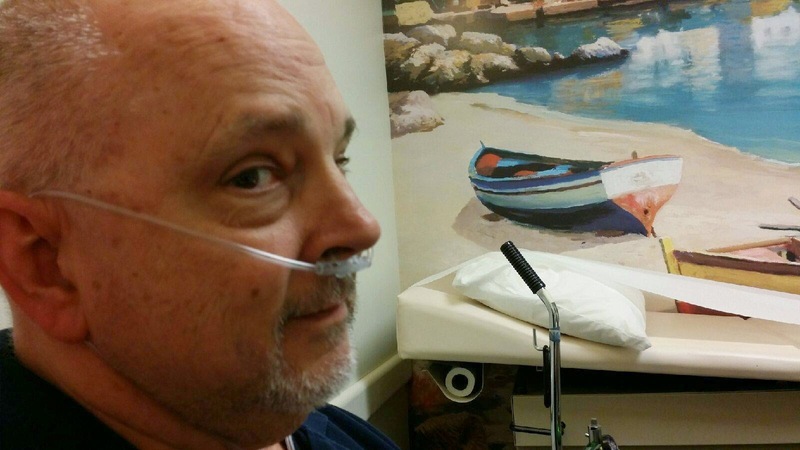 The photo in this post shows me wearing an oxygen cannula. I will soon be carrying oxygen during the day, and I wanted to let you know “what’s up?”. I’ve recently been diagnosed with “IPF”, or Ideopathic Pulmonary Fibrosis. It has been confirmed by two pulmonologists, pulmonary function tests, x-rays & high-res CT scans. The ‘ideopathic’ means there is no known cause (I have never smoked). It is a degenerative, fatal lung disease. This is no cure. It claims the same number of lives in the US each year as breast cancer (app. 40,000), but only 128,000 have it (in US). There are a couple new meds out that can help slow down the progression of lung scarring, but the only way out of it is a lung transplant. Pulmonary rehab will help me learn to breathe better and build my stamina (I am usually very short of breath, even with just walking across the street). My condition has significantly worsened over the past 2 years, and especially the past 6 months. The oxygen will help keep my O2 level up, but it isn’t therapeutic. If you look it up on “Dr. Google”, the prognosis is not good. I’ve included a link and a video (at the end of the post) that help explain it (if you’re interested in knowing more about it). OK, that’s the info. So, now what? I am not in imminent danger, and death isn’t right around the corner! I am not at a point where you’ll be seeing “Caring Bridge” updates yet (a great site, BTW!). I can still work, albeit somewhat modified. But things are going to be different now. 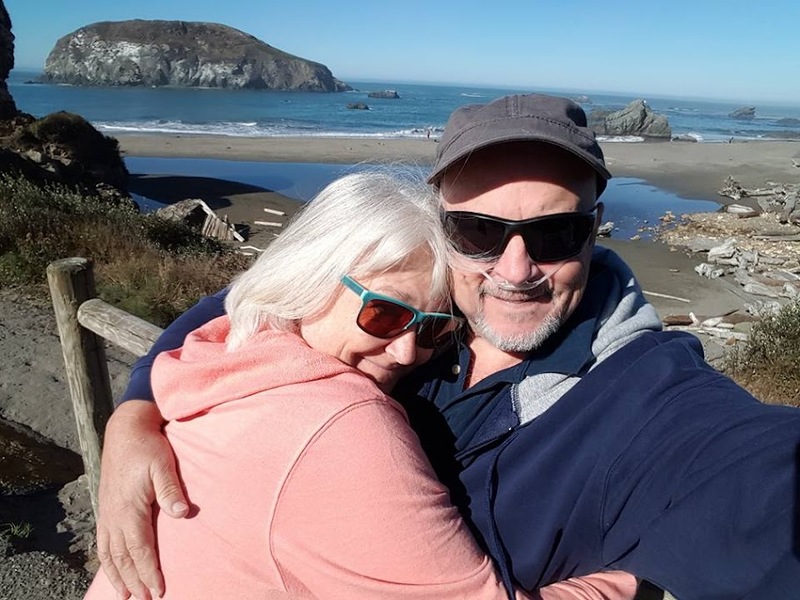 Debbie & I love to travel (and still plan to), but we won’t be able to take the long hikes we so love together anymore. I still can play music, and even sing somewhat – singing actually helps! My activity level has been greatly curtailed, so we’re in a “transition mode”, adjusting to our new reality. Debbie and I are obviously not thrilled about this, but we refuse to let this defeat us and get us down! In the 13 years we’ve been together, we’ve done more than most couples do in 60 years of marriage. Our lives are full, and we’re surrounded and supported by family and amazing friends. Our faith holds us strong, and we know that God causes all things to work TOGETHER for good. I’m not trying to be morbid, but in reality – life is 100% fatal for everyone! Sometimes we have the opportunity to catch a glimpse of the end of our life span on Earth, and it can radically change our perspective. We purpose to change our perspective in a positive and uplifting way! If you are local and see me in person, don’t feel like you have to be all down and depressed for me – just be normal and natural. If you feel awkward talking to me, no worries! I won’t think less of you! Whether I’m on this Earth a couple more years or much longer, I just plan to be me – and hopefully deepen the relationships I have with everyone! Prayers are appreciated!